Drop-in deep, modern oval bath with flat rim. 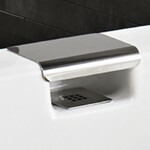 End drain allows for a longer bathing area. Unique drain system allows for a deep soak. Ergonomically designed head and back rests to support the body perfectly. The pure design of the Neptune TAO Collection is ultra modern, allowing deck mount installations with the choice of a 2" or a 4" lip. Tub Size: 59 3/4" x 31 1/2" x 22 3/8"